Structural steel design allows builders to create a range of beautiful building applications that are not limited by the material’s strength or ductility. You can employ a local steel fabrication company to produce a wide range of products for your building, from beams and columns to ladders, steel decks, and more. Hiring an experienced team can help to ensure that you benefit from precise results across every application, which is why Sanilac Steel is here and ready to help clients from across the Great Lake State achieve the best results. Since 1967, our structural steel fabricators in Michigan have delivered ideal results across a wide range of building applications, relying on our professional process to provide custom fabrication results that cannot be beat. Today, we’ll continue to highlight the range of our steel fabrication services by discussing five more products we commonly produce here at our facility in Marlette. If you’re ready to see how advantageous and cost-effective our steel design, fabrication, and erection services can be, then be sure to contact us today! Connecting your steel components to other fixtures relies on the best products to ensure an ideal fit. Our structural connectors can bolt onto your frame without the need for welding when applicable. Precision is essential in connection applications because a minor discrepancy in size can lead to racking, where the bolt moves back and forth and weakens the joint. If you plan on utilizing a steel frame for your structure, keep in mind that a variety of connection devices will be required for the best results. Your building can rely on prefabricated metal stairs for a precise fit at any stage of construction, or you can rely on our structural steel fabricators for customized systems that conform fluidly to your design while adhering to all fire and safety regulations. Pre-engineered stairs provide exacting dimensions that can be seamlessly incorporated into your building design with predetermined strengths and attributes. Sanilac Steel has produced a wide range of steel stair systems, including straight stairs, spiral stairs, catwalks, crossover bridges, and more to fit every industry need. Introducing stairs that are not designed optimally can create safety concerns for your facility. It pays to find an experienced team to do the job right, which is why Sanilac Steel employs experienced specialists to handle all of your building’s stair needs. Steel railings provide an integral role in keeping individuals safe on stair systems and along ledges. It is vital for builders to employ industry experts to ensure all railing systems are installed correctly to minimize the chances of injury. Proper installation helps to eliminate high-risk areas for the life of the structure and improve safety. Your railings can also serve an aesthetic purpose in addition to a functional one. Commercial buildings rely on high-quality visuals to enhance the quality behind their brand, which is why personalized metal railings can deliver ideal value. Builders, designers, and architects can rely on modern metal designs to provide rails that look much sleeker than your classic options. Modern steel has evolved to become an ideal medium for creating structurally sound building elements that can conform to a variety of shapes and sizes. 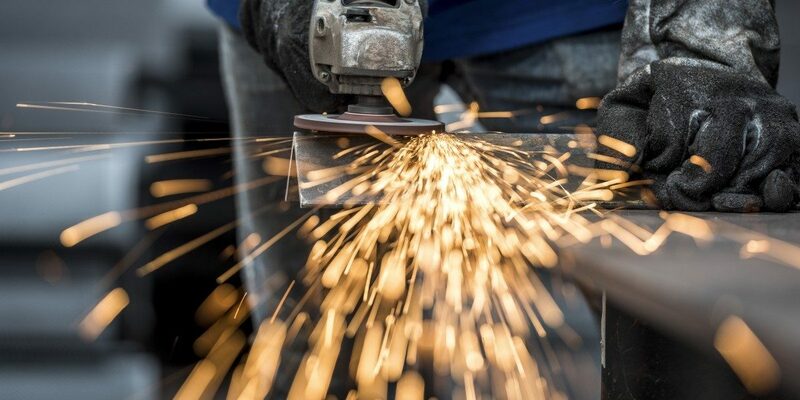 Our structural steel fabricators can add aesthetic beauty into any of your metal services, creating beautiful outcomes that are long-lasting and affordable. Do you have custom metal work in mind? Call our team to learn about some of our ornamental metal projects, and be sure to see if we can bring your design to life! Sanilac Steel has the equipment needed to deliver a wide range of results for every project. Whether you’re planning on a high-rise building or fabricating your prototype, our structural steel team is here and ready to deliver customized services and ideal results. We can work with you every step of the way to determine the total strength, effectiveness, and sustainability of your prototype design, relying on our experience to offer improvements where possible. We are proud to employ the most experienced structural steel fabricators across Michigan, and will help you every step of the way to create an ideal outcome for your project. Learn about the quality and affordability of our services, and be sure to contact us for a free project estimate!